In the lead up to the arrival of our firstborn, my mother-in-law inundated us with new white fluffy towels for the baby. At the time, I did think she had gone around some sort of newly appointed grandmother bend, but I have to admit, there was something about a sweet little wet wriggling baby burrito wrapped in his very own towel that made bath time all the more sweeter. These new gems from Aden + Anais fit the bath time brief perfectly. 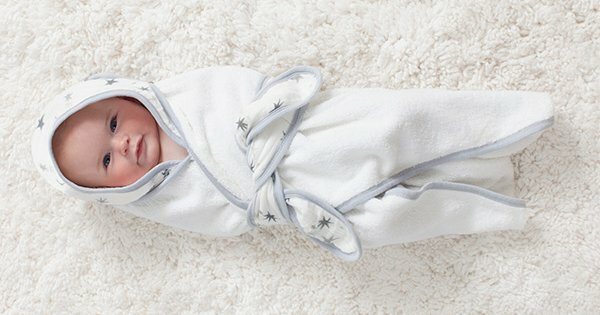 Aden + Anais Baby Bath Wrap is made from soft and thirsty terry towelling with a pure cotton muslin hood and tie. Designed to fit newborns, there’s room for a growing baby too. With five prints available (Star in fluro blue or fluro pink, Twinkle, Princess Posie and Jungle Jam) I predict the Aden + Anais Baby Bath Wrap, priced $44.95, is set to become one of your go-to baby gifts. Older children needn’t miss out, a practical gift is always a great gift – the Toddler Towel is generously sized at 127 x 76 centimetres and made from the same soft and snug terry towelling with a band of printed muslin to adding a pop of colour and fun to bath time. Available in the same five designs as the Baby Bath Wrap, the Toddler Towel is priced $37.95. To see all the new designs on offer, head on over to Aden + Anais.